Medical waste boxes are an important tool in the public health and safety arsenal. When the red disposal bags are full, they need to be packaged properly in order to be transported to a waste facility. Large medical waste boxes allow for multiple different sized red bags to be collected together. The box provides an extra layer of protection in the event of spills or holes in the red bags. For properly disposing household medical waste, please read this article. Special boxes are required in order to pack red disposal bags. You can order these boxes from your local medical waste company. These boxes also come with customer slips which identify you for the delivery and pick-up drivers. The medical waste box is set-up just like a moving box would be. The bottom of the box needs to be taped four different times. There is a long piece of tape lengthwise and then three pieces of tape across the width of the box. It is important that you leave the top of the box with the perforated cutouts intact. Once the box is built, you place the red bag inside the box. Make sure to overlay the edges of the bag on the perforated cutouts. This will eliminate the risk of medical waste falling between the red bag and the outer box. Once the disposal bag is full, you need to seal the bag and then seal the box. Make sure to wear gloves every time you seal a bag and box. The red bag needs to be closed prior to the box shutting. Use white tape that will stick to plastic. Scrunch the top of the bag together and then wrap tape three times. Using the perforated components of the box, fold it together in a way that seals evenly and securely. Using the moving tape, seal the top of the box the same way that you seal the bottom of the box. Complete your information on the customer label and place it in the proper location on the box. It is important that you place it properly so that it is easier for the delivery drivers to scan the box. Your box is now ready to go for transportation! 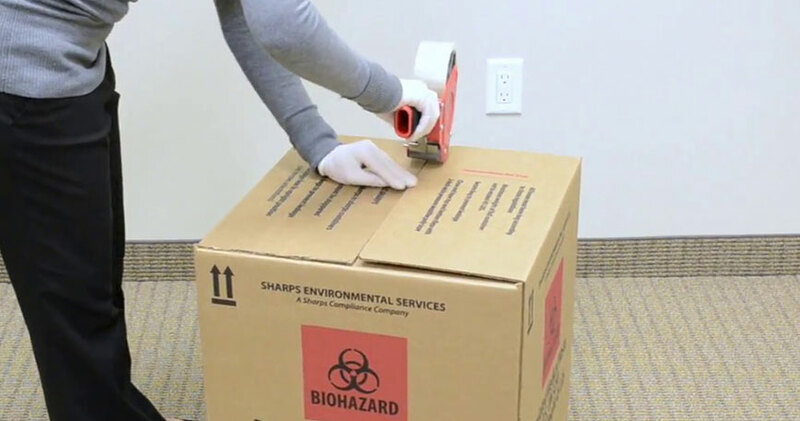 Packaging red medical waste bags into the proper box is the final step to ensure that all medical waste is transported in a way that minimizes any public health risk. The most important thing to remember is that these boxes need to be picked up properly by medical waste professional transportation personnel like Glycon LLC. This completes the process of properly disposing of medical waste.